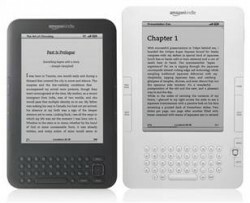 Kindle 3 Announced: 3G for $189, Wi-Fi for $139 E-Ink vs. LCD: What’s The Difference? The new, smaller K3 next to the K2. This pic would be better for my previous post, but I really like it. Apple claims they could have up to 22% of the e-book market. Barnes & Noble claims a similar share. And what about Sony, or Kobo? And what does that leave Amazon, presumably still the largest e-book seller? Despite all the numbers being tossed around, I’ve known for a while that Amazon had the lion’s share of e-book sales. Well, today I saw official confirmation from Amazon, which announced that it owns 70% to 80% of the e-book market. When asked about Apple’s 22% claim and B&N’s 20% claim, Ian Freed (Amazon VP in charge of the Kindle) essentially said that he wasn’t calling anyone a liar, but he’s sure of Amazon’s numbers. Well, how can Amazon have 75%, and Apple and B&N both claim about 20%? Freed says that “something doesn’t add up,” but that Amazon is pretty sure the 75% is right. Now, he’s not gonna say who’s wrong, just that (a) Amazon’s numbers are accurate and (b) therefore someone else’s aren’t. It’s pretty clear to me the exaggerating culprit is Apple. I won’t go so far as to call their figures lies (what’s the saying about “figures don’t lie, but liars figure”? ), but their “5 million e-book downloads” number and their “22% of e-books sold” number deserve a second look. First of all, they didn’t specify whether that 5 million figure included free e-book downloads, so it probably did. Maybe they only sold 1/10th that amount. (Which would amount to 500,000 sales across 2 million iPads over two months … or only 1.5 e-books per iPad per year.) As for the 22%? The consensus is that Apple was referring only to sales from Penguin for the month of April … which is coincidentally when Penguin was negotiating new terms with Amazon and their titles were not available on Amazon. Hardly a representative figure for the overall e-book market. So what are the real numbers? Let’s work from what we know. Amazon announced last month that it sold 867,881 out of James Patterson’s 1.4 million e-book sales (Patterson is the #1 e-book bestseller). That equates to 76%. Combine that with Amazon’s recent “70 to 80 percent” statement, and I think it’s safe to say that Amazon owns about 75% of the overall e-book market. I think it’s safe to say that Amazon is still comfortably on top, and that Apple might be exaggerating just a tad, since they don’t even account for 1% of my e-book sales, and my books were on the iBook Store from day one (April 3). Of course, my numbers won’t match up to industry totals exactly: some places (Amazon) are more friendly to indie e-books and their stores make it easier to find our works than others (*cough* Apple *cough*). And the percentages for Kobo and B&N are generally increasing. B&N in particular surprised me with very strong numbers: in June, I sold almost 1/6th as many books through B&N as I did through Amazon, and my books have been up on Amazon longer (and thus have more reviews, etc.). Taken together, it’s clear to me that Amazon has the dominant share of e-book sales: about 75%. I believe B&N when they say they’re close to 20% of the market — probably somewhere around 18%. That leaves Kobo, Sony, and Apple fighting over the last 7% or so. And my guess is that Apple is in no better than 5th place right now. Another interesting tidbit from Ian Freed: 80% of Amazon’s e-book sales are to customers who own Kindles. So much for those “Sure, Amazon is selling e-books, but mostly to people who read on their iPads” articles. Maybe finally people can stop pretending the iPad is an e-reader and start considering it as a tablet computer that’s cool to play games on? UPDATE: B&N released confirmation that their e-book share just surpassed its print share, which is 17%. Sounds like 18-20% to me! While you may very well be right, I gotta say that if we go with individual authors as proof, MY stats have Smashwords blowing all the rest out of the water. The stats provided by people on the Kindleboards showed quite a bit of variation, though their figures were closer to yours. However reporting is pretty shaky for those who publish through a third party as yet (which includes most Indies). I suspect that Apple doesn’t sell much in the way of Indie Authors at all yet. Their original figure of 22 percent WAS born out by figures of the major publishers. And both Amazon and Apple are known for their secrecy and spin. Thanks for your comment … I’m sure Apple’s numbers are better for well-known authors than for indies like myself, since Apple’s virtual bookstore makes it easy to find the well-promoted bestsellers, but difficult to find books “off the beaten path.” I’d still doubt they’re very close to 22% of all e-book sales, though. My understanding is that number represented sales from only one large publisher. Remember that the largest publisher, Random House, doesn’t even have their books on the iBook Store, and that Apple only has 30,000 titles, compared to over 630,000 on Amazon. But you’re right, both companies are secretive and often “creative” with the numbers they put out, which is why I wanted to try to shed some light on the real numbers in this post. From everything I can tell, in this case, I think the truth is closer to Amazon’s numbers than Apple’s. So far Apple is very unfriendly territory for indie authors, which is interesting. I’m afraid I think that in itself says something about Apple. Considering the success of some indie authors and indies as a whole, I think it’s a mistake on their part but they aren’t exactly known for listening. Anyway, everything I’ve seen agrees with you in general at least. Amazon is definitely the big player in ebooks and Apple has a long way to go. I think Apple made an attempt to pretend they cared about books for iPad marketing purposes: they could claim it was the “#1 selling e-reader” instead of the “#27 (or whatever) selling portable computer.” But they really haven’t improved iBooks or the iBook Store to make it competitive. And Apple certainly hasn’t promoted their indie authors the way Amazon or B&N have, nor has Apple made it easy for indies to publish directly (doing so with Apple requires a Mac and an expensive, useless ISBN number). Bottom line, my overall Apple e-book sales are about 1/200th (0.5%) that of Amazon. No more than a rounding error.